Hi everyone! If you have been following along you know we teamed up with the fabulous Becky Fleck from Page Maps and were provided with some awesome sketches for July! Here was mine. 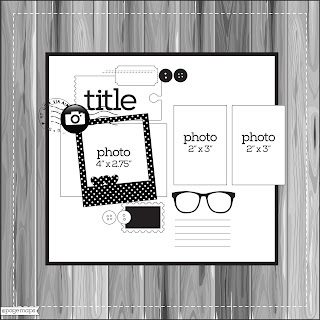 Courtney Lee from Court's Crafts here with a ... now don't keel over from shock ... a layout! I stayed really true to the sketch and used it as my beginner's diving board and just launched myself into the deep end of scrapbooking! We had this AMAZING time in Barcelona last year and I just had to capture the first moment that the girls put their feet in the Mediterranean Sea. I wanted to keep the button elements from the sketch as I thought they were darling and the heart element on the photo mat. This little heart was the cut out of the photo mat and the sun and clouds were from the odds and ends in the Spring Things collection. I wanted to keep those two stitched lines in there as well. They were my very last addition to the layout but I think it pulled the title into the rest of the page. I kept the top left button in place but I moved the other button bottom right. Like I said I really kept to the sketch. 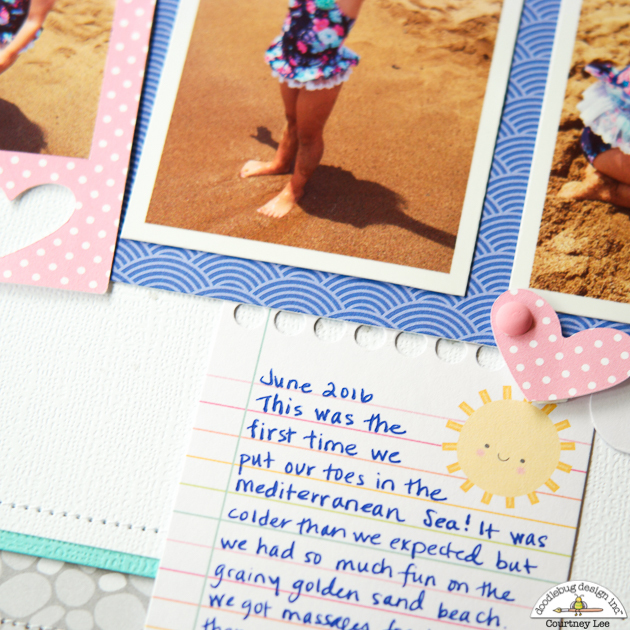 :) When they are good I realized through this process that it really makes scrapbooking "easy". Did you remember that ribbon loop I was telling you about? Hidden journaling is "in" right now so I thought I would give it a try. The journaling notebook sheet is from the same odds and ends pack in the Spring Things collection. Is anyone else out there self conscious about their handwriting?! Knowing this was going onto the blog had me sweating in my boots! LOL. I hope you enjoyed this layout and that you use some of these sketches to make awesome layouts of your own! We cannot wait to see them!